Danger decides that we should climb Epinephrine. I agree. I excitedly tell my roommate and bud Issac. He must climb it too.We painfully wake up pre-dawn. I hastily pack a second headlamp and force down some stale cheese-its and join Issac and Danger in the Fuggin’ Honda. I slept all the way there and spaced out for most of the approach so it seemed like I just arrived at Epinephrine. There were let a group go in front of us because they seemed like the kind of people that we wouldn’t see again after the first pitch. Suspicion confirmed when the leader confidently skipped a high first bolt. Issac climbed the scary slabby first pitch like a boss. I took forever leading the second pitch. There was one spot where I could not find anywhere to place gear on a short chimney pitch that should have been easy. I finally found a nut placement and made it to the bolted anchors. I looked down at my harness to discover… my belay device was gone! The night before I had seen Danger tie a knot called the “Munter hitch“. 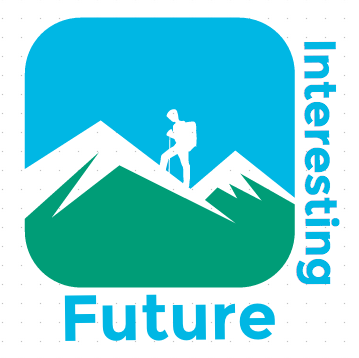 I tied it, tested it a few times and shouted down, “Danger, come on up!” I’m just realizing right now how confusing that might be for the uninitiated to hear someone yell… Anyway, Danger climbs half way up and calls up to me, “I found your belay device! 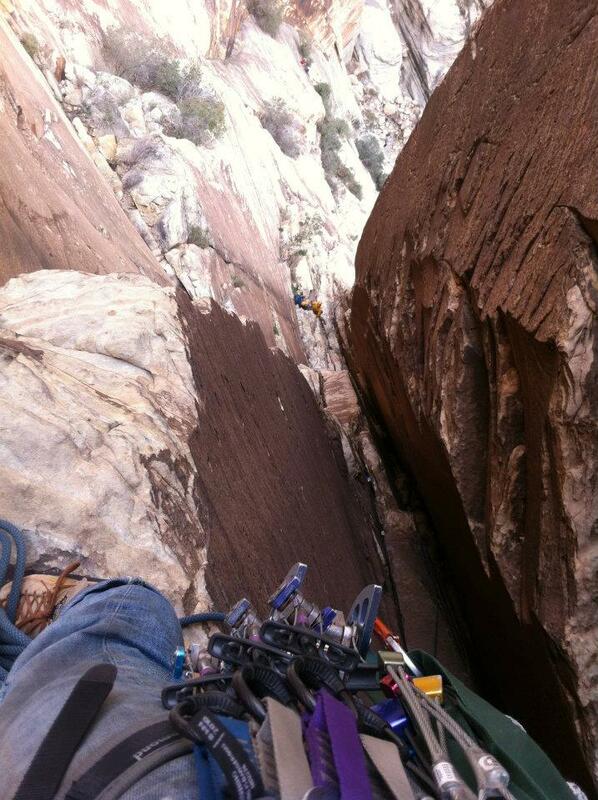 What are you belaying me with?” I told him that he was fine. 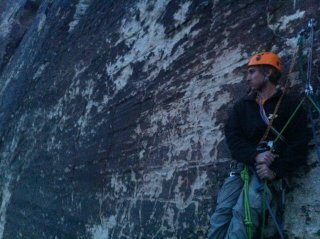 Danger joins me on a small ledge and says, “How did you manage to lose your belay device ya dupe?” Danger is preparing to belay Issac up. I look over the edge and see an unnatural shiny green object hurtle off the cliff. I ask Danger, ” Was that your belay device?” It was his belay device. I have a good long laugh and Danger belays Issac up with a Munter hitch. 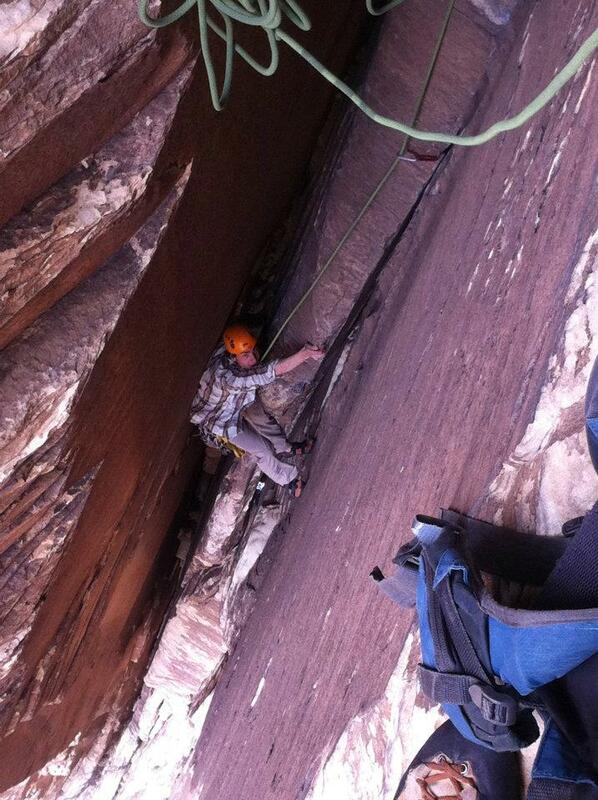 Issac climbs up and we see that he has Danger’s belay device clipped to his gear loop. Turns out that it miraculously landed on a tiny ledge within arms reach. Danger lead the hardest chimney pitches. 5.9 chimneys are hard! You must struggle and scrape your body along sandpaper sandstone until you are completely exhausted then look down at your six inches of progress and be pleased. This is a chimney. It is smooth like glass but will also tear your clothes somehow. We made it to the top of a formation called the dark tower. Which contained all the hardest pitches. Unfortunately it was getting dark and we needed a way down. 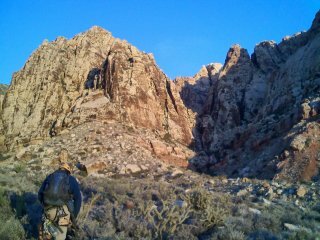 Headlamps became necessary when Issac lead a slabby run out pitch that we thought would put us in an easily rappel-able section. Issac climbs up to the first bolt and a good amount of feet past it. Issac couldn’t find the next bolt and was starting to pump out in a near decking zone. Suddenly, Issac yells, “Ahhhh! 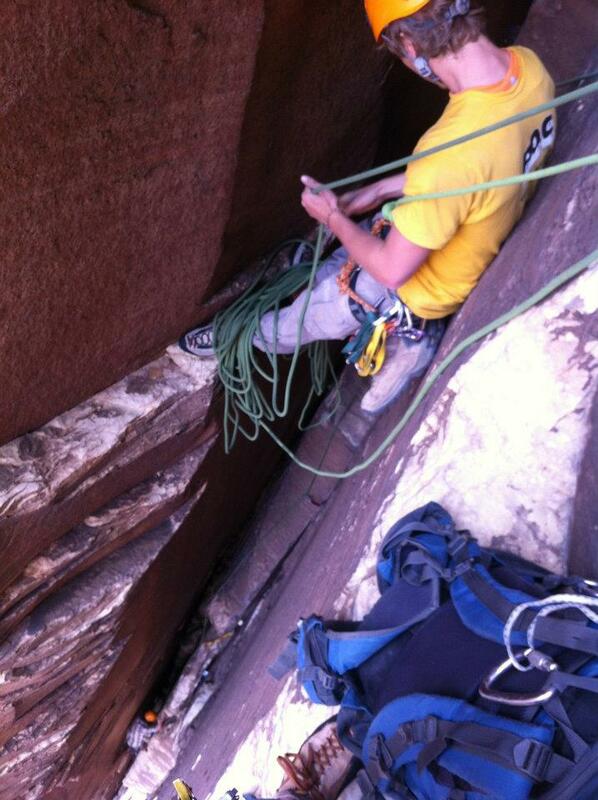 (Danger cranks down his belay device) I’ve found a bolt!” Danger and I realize that we were not breathing. 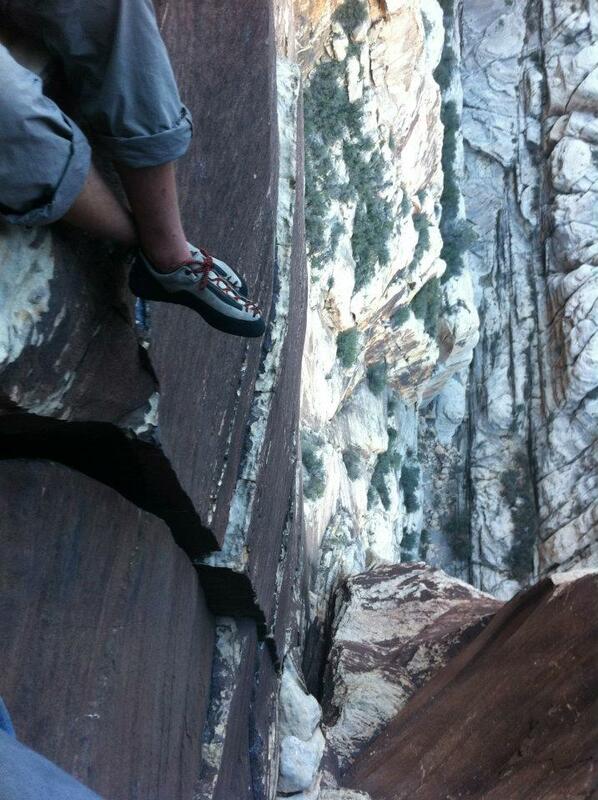 Issac climbed up and clipped a few bolts that Danger and I didn’t see and cuts feet on an overhang. This ordinarily would have been poor technique but our legs were destroyed from the chimney pitches and we had a lot more trust in our arms. 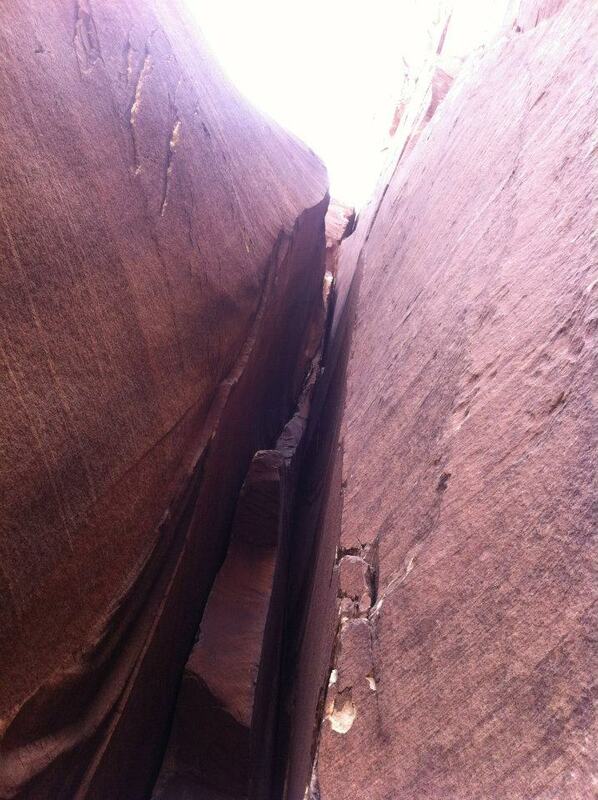 Danger and I climb up to Issac and do a short traverse pitch. We see some webbing tied to a rock. We decided that people must rappel from here. I am the lightest so I rapped down first because I am the tiniest man and would be the easiest to haul back up if I ended up on a blank face. Turns out we weren’t where we thought we were but I found some permanent anchors anyway. Although, when Issac and Danger came down and we tried to pull the rope through it got stuck immediately. We struggled to get the rope down for at least half an hour and seriously considered sleeping on a cold hanging belay in a deafening wind. Finally the rope came down. 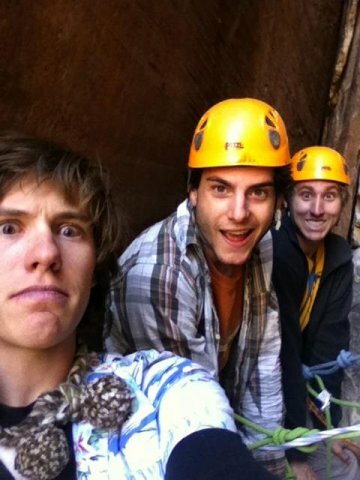 For the next rappel Danger tied a Euro death knot Patagonia knot and the rope didn’t get stuck again. After some difficulty finding permanent anchors we reach the bottom of the route around 12:30AM. I was pretty tired and delirious f0r the hike out. We arrived in Vegas around 1:30AM and had ourselves some fun times with good friends until around 5AM. There was much sleeping the next day. We slept in a hot tub. 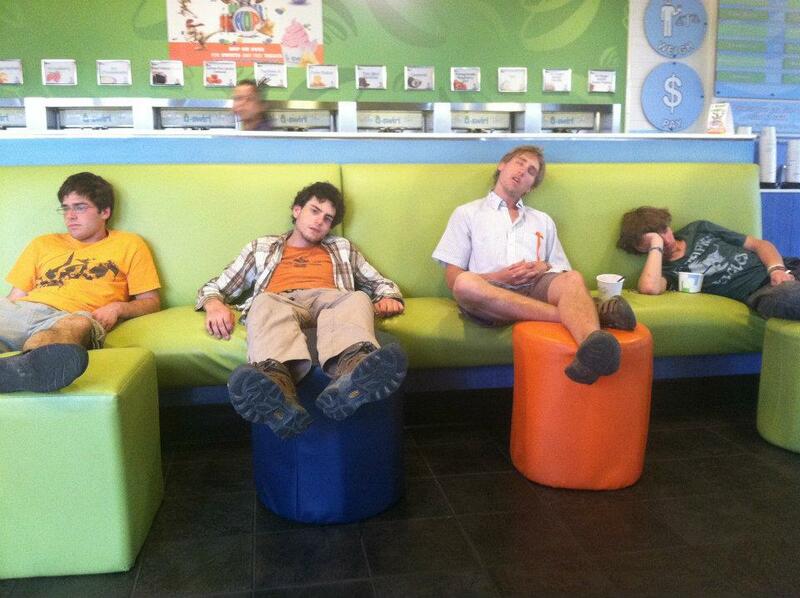 We slept in a frozen yogurt shop for about 4 hours. Best yogurt shop ever. We smelled terrible and we were obnoxious and then we fell asleep. No one bothered us or asked us to leave. One lady did ask to take a picture of us because we were so ridiculous. Here’s the address. Everyone should go to there.